Ribbons are useful and decorative fabrics that are almost infinite in their variety, texture, and color. Modern ribbons are manufactured from every kind of fabric, from velvet and satin to synthetics like nylon and rayon. They are patterned, printed, woven, braided, adorned with embroidery, decorated with pearls or sequins, shaped like ric-rac, skillfully made like lace, edged with metal so they can be molded and shaped, and crafted like motif ribbons. Ribbon is classified by the textile industry as a narrow fabric, and it ranges from 1/8 in-I ft (0.32-30 cm) in width. Its uses may most often be thought of as decorative, but ribbons are also materials for making larger fabrics by weaving, crocheting, or knitting them together. Ribbons appeared when civilizations began crafting fabrics. They are among the oldest decorative or adorning materials. People have always looked for ways to personalize their clothing and household goods. When all textiles were handmade, items with the finest threads were the most expensive. But the simplest, most coarse textiles in plain colors could be made more elegant and individual with a bit of ribbon as decoration. In the Middle Ages, peddlers traveled throughout Europe selling exotic ribbons; the tales of Geoffrey Chaucer mention "ribbands" used to adorn garments. Medieval and Renaissance patrons bought ribbons woven with gold and silver thread and made from silk and other rare fabrics from the Orient. The modern ribbon with selvedges (finished edges) came into being by 1500. Ribbons were so identified with luxury that, during the sixteenth century, the English Parliament tried to make the wearing of ribbons a right of only the nobility. They were also identified with certain orders of merit; the Knights of the Garter wear broad blue sashes to this day, and the Knights of Bath wear red. By the seventeenth century, ribbons stormed the fashion world. Both men's and women's clothing of this period were extravagant, and every accessory from gloves to bonnets was festooned with ribbons in many forms. A length of ribbon could be given as a gift to decorate clothing, for use in braiding and curling hair, for ornamenting baskets and furniture, or for brightening linens. Ornately patterned household fabrics were further bedecked with ruchings (gathered ribbons), frills, and rosettes. The huge demand for more elaborate ribbons prompted a manufacturing revolution in which Coventry, England, and Lyons, France, became hubs of ribbon design and generation. This ribbon industry sprang from the silk trade. Merchants who traveled the "Silk Road" to and from Asia sold raw silk to middlemen in Europe who boiled, cleaned, and dyed the ribbon yarn and sold it in "twists" to weavers. The weavers used specially scaled looms and scores of laborers to weave ribbons on hand-operated looms. The products were sold in the major cities and exported for trade. The enormous demand for ribbon was one of the sparks of the Industrial Revolution. 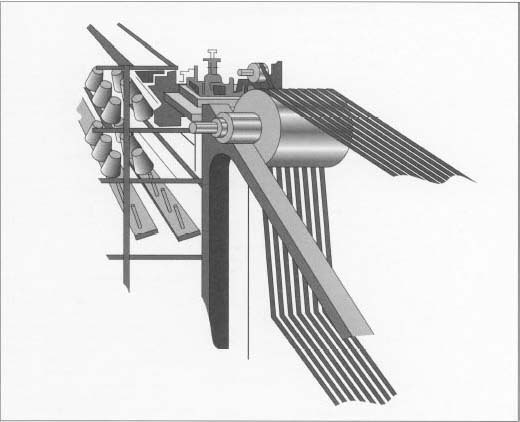 In the 1770s, the Dutch engine loom was developed, and six types of ribbon could be produced simultaneously under the watchful eye of one operator. This development came just in time to decorate the towering wigs in fashion in the courts of Europe. Curiously, in the fledgling colonies in the Americas, ribbons were seldom worn at this time, perhaps due to religious convictions or in opposition to the extravagances of European rulers. Peasant costumes of many lands are often distinguished by single or braided ribbons that are dyed bright colors, decorated with lace or beads, or patterned. Unique designs came to characterize cultures. During the Napoleonic Wars early in the nineteenth century, the ribbon industry suffered a major decline because skilled weavers from England and Western Europe were recruited for military service. With the supply restricted, the demand for ribbon was even greater, and ribbons were a popular cargo for smugglers. The next ribbon "boom" occurred in 1813, when picot-edged ribbon (with tiny scallops along the sides) became a fashion must. Ribbon-weavers reaped the benefits for the two years picot-edged ribbon topped the fashion charts. Ribbons often followed fashion trends. Deaths at the courts of Europe stimulated the demand for black ribbon; military tapes, jacquards, and medal ribbons became symbols of military regiments and the highest awards nations could bestow. The Victorian Era was the last to see a ribbon boom when the dresses, underclothes, coats and cloaks, and hats of Victorian ladies used yards of ribbon. Trade agreements between European countries killed the English manufacture of ribbon because cheap labor and ever-larger looms could not produce competitively priced products. These manufacturers survived by diversifying and producing braids, cords, fringes, silk pictures, and bookmarks. The development of synthetics and paper fibers for use in making gift wrap quickly extended to the ribbon world in our times, and ribbon became as adaptable to modern living as other fabrics. Many types of ribbon today are colorfast, shrink resistant, and able to be washed or dry cleaned. Ribbon can be manufactured from a wide range of materials, and their manufacture is classified by type and texture. The three principle categories of manufacture are cut-edge, woven-edge, and wire-edge ribbons. Woven-edge ribbons are most common to the textile industry; they are narrow pieces of fabric with two "selvedges" or woven edges that can be straight or shaped. These ribbons are usually washable because the woven edges prevent them from fraying. Wire-edge ribbons can be cut from broader strips of cloth with their edges wrapped over thin wires, or the wire can be woven into the fabric along the edges or down the middle. Wire mesh can also be woven to make ribbon with or without the addition of yarns or silks for color. Wire-edge ribbon is versatile because the wire allows it to hold a definite shape, but the material can not be washed. Cut-edge or craft ribbon is the type most often used for gift wrap. The fabric is patterned, printed, or decorated with designs transferred by heat then cut to the needed width. The product is then treated with a stiffener that prevents the edges from unraveling. High quality cut-edge ribbon is made of acetate, a thermoplastic, which is cut by a hot knife that fuses the edge instantly. After the particular thread for ribbon has been spun, dyed, and treated, it is rolled on bobbins. The bobbins are placed on a ribbon loom that consists of a series of miniature looms, each with its own shuttle and warp sized to produce the desired width of ribbon. The woven product emerges on rollers that carry it forward for further processing such as adding glues, stiffeners, or fabric treatments. A winder then places the ribbon on spools for packaging and sale. overlapping several textural types. Jacquards are prized for elaborate design woven into the ribbon, and they are very expensive to manufacture. The desired behavior of the ribbon often dictates the material and any surface treatments used. Curling ribbon, for example, is bathed in glue that is pressed thin by rollers and dried. The glue gives the ribbon its curling properties. Other raw materials include ink for printing on finished ribbon, and paper and plastics if the ribbon manufacturers also make their own spools and packaging. Ribbons are designed in much the same way as fabrics. Colors are chosen depending on fashion trends, seasons, and intended uses. Materials are selected based on use, wearability, cleaning requirements, and fabric trends that the ribbons must match. Sales records are also considered because ribbons go in and out of fashion and are sometimes discontinued. The width and pattern of the ribbon must also be designed. As narrow fabrics, ribbons are 1/8 in-1 ft (0.32-30 cm) wide, although the ribbon industry has adopted the French "ligne" as its unit of measure. The ligne is about 1/11 inch (0.67 mm) wide. Many patterns and designs can be woven into the ribbon, and ribbon can be printed or ornamented by virtually any type of printing method so the pattern or trim, such as sequins, appears on one side. The process of manufacturing a particular kind of thread can vary widely, from the spinning of silk to the carding and processing of wool. After the particular thread for ribbon has been spun, dyed, and treated, it is rolled on bobbins. The bobbins are placed on a ribbon loom that consists of a series of miniature looms, each with its own shuttle and warp (lengths of yarn) sized to produce the desired width of ribbon. The ribbon loom may weave as many as 144 pieces of fabric simultaneously. Today's ribbon looms can be very elaborate and computerized to produce detailed designs like jacquards less expensively than the looms or weavers of the past. The threads leading from the bobbins are guided by a series of eye hooks that hold the position of each thread and raise and lower it as the fabric is woven. The bobbins (also called cheeses) control the warp and are a major difference between ribbon loom and a fabric loom, which uses a warp beam to raise and lower the warp and cloth. The bobbins may also be curved to save space on the machine. The tension of the warp thread on a ribbon loom is maintained by a series of pulleys. A rack and pinion mechanism is used to adjust the lay (flatness or slope) of the loom. To produce fancy effects, ingenious devices, selection of fabrics, and weaving techniques are used. Threads of different colors or multiple fibers can be woven together. Odd color effects can be achieved because the fibers may take dye differently. The woven product emerges on rollers that carry it forward for further processing such as adding glues, stiffeners, or fabric treatments. Machines equipped with pairs of rollers press and dry the treated ribbon, and large reels are used to collect the treated product. As the ribbon is wound onto spools, the tension is maintained by a governor so the ribbon does not fall slack on the spools. If the ribbon is to be printed or embossed, it is then processed through a calendar that smoothes the surface to be printed and through a printing or stamping machine. A winder then places the ribbon on spools for packaging and sale. The machines used to process one type of ribbon, but perhaps multiple varieties or colors of it, are arranged in a series and in a layout so that one operator can monitor one ribbon loom producing many ribbons in a series. Careful attention is paid to the detail in the ribbon, and the operators control the quality of the product as well as maintain the machines. Ribbon mills produce some fabric waste at the start and end of each ribbon production, and this is disposed. Ribbon mills usually produce a range of other ornamental products as well, such as braid, cord, and ric-rac. Ribbon manufacturers seem to have guaranteed the future of their product by the variety and ingenuity of their output. While fashion trends may cause particular types of ribbon to fade in and out of favor, the outcasts are quickly replaced by new products. Computer techniques have enhanced both design and manufacturing processes. They allow infinite combinations to be generated on screen, and intricate procedures that were previously cost-prohibitive may be possible with computer-controlled manufacturing. Collier, Ann M. A Handbook of Textiles. Pergamon Press, 1974. Corbman, Bernard P. Textiles: Fiber to Fabric. Gregg Division, McGraw-Hill Book Company, 1983. Evans, Hilary. Ribbonwork. Bobbs-Merrill, 1976. Hall, A. J. The Standard Handbook of Textiles. Heywood Books, 1969. Kerridge, Eric. Textile Manufactures in Early Modern England. Manchester University Press, 1985. Lewis, Annabel. The Ultimate Ribbon Book. Trafalgar Square Publishing, 1995. Linton, George E. The Modern Textile Dictionary. Duell, Sloan and Pearce, 1954. Miller, Edward. Textiles: Properties and Behaviour. Theatre Arts Books, 1970. Allen, Frederick. "The Ribbon Factory." Invention & Technology, Spring 1995. "Make silk ribbon embroidery." Woman's Day, July 16, 1996, p. 23. "Stylist secrets." Redbook, January 1995, p. 25. Thorough article. Good read. Thanks for your research on this subject.